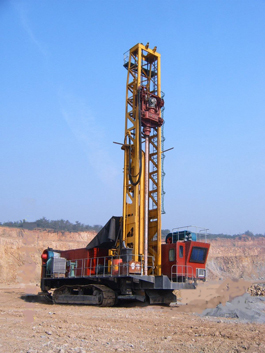 We have the most advanced drilling technologies and products at our disposal. Geowell’s positive pulse MWD system was developed with two particular goals in mind: Reliability and Sustainability. Our MWD systems are resistant to high concentrations of lost circulation materials in the harshest drilling environments. Our client base will receive a robust, downlink-capable system that is simply superior to most MWD systems available. The robust NVADER pulser is perfect for any lost circulation issues. Geowell’s rotary connections decrease tool length resulting in closer gamma and directional sensors to the bit. Conventional MWD systems suffer from performance, reliability and maintainability issues and are prone to failure in high-percentage LCM, high wash, and harsh environments. Geowells aims to offer the most power-efficient and reliable positive pulse motors in the market to our clients. This improves durability, efficiency, flexibility, performance, and sustainability. Our smart collar tool was designed to eliminate the expense of an on-site MWD operator and/or directional driller. It is easy to operate from the rig floor through the Pason Directional program while acquiring only inclination and azimuth. If tool faces or gamma are required, an additional high-resolution monitor is installed in the cockpit that allows for remote support in steering the wellbore and/or remotely logging gamma. We set up the VMS/RVMS system in our shop and then it is delivered to your site and left with rig personnel. The personnel simply put it in the bottom hole assembly and start drilling. We have some of the most robust power sections and motors in the market. Proven in challenging and hot hole drilling conditions, our motors consistently give out some good output. Our motors provide some of the highest flow and torque values in the market thus increasing the rate of penetration significantly. Our motors are made of high-quality steel and minimal components making for robust equipment which offer great performance even in extreme temperature and pressure environments. We offer 3 ¾” to 9 5/8” motors in every available power/torque ratio. Motors are available in fixed and adjustable bend and feature a 50” bit to bend with a 34” spacing available upon request. We also avail specific power sections for job-specific purposes thus ensuring fast drilling times on every job we take. AP Impact System: Free stuck drill stem components in vertical or deviated wells with a comprehensive package consisting of Hydra-Jar AP double-acting hydraulic drilling jar, accelerator AP impact tool, and a drill string analysis program. Hydra-Jar AP Double-Acting Hydraulic Drilling Jar: Free stuck drill stem components during drilling or workover operations in vertical or deviated wells. Accelerator AP Impact Tool: Maximize the impact force of the Hydra-Jar AP drilling jar by providing additional stretch in the drill string when conditions may not be right for a drilling jar to work alone. HydraQuaker Hydraulic Drilling Jar: Fire up or down by simply raising or lowering the drill string; get higher overpull capacity and impact capability to hit harder than other jars of the same size. Shock Sub Impact & Vibration Reduction Sub: Reduce impact loads produced during milling and drilling operations, increasing rate of production and extending equipment life. Designed to increase the rate of penetration and to control deviation, our drill stabilizers are economical to use, reducing drilling costs per meter. OnGauge Sealed-Bearing Roller Reamer: Minimize stick/slip and downhole vibration with torque reduction. Diamond-Enhanced Insert Reamer: Obtain a quality, full-gauge wellbore in soft to medium-hard formations with synthetic diamond-enhanced inserts (DEIs). With no moving or sealed components, the reamer is not affected by hot hole conditions. DOG Drilling On Gauge Sub: Place between the bit and the mud motor in directional applications for at-the-bit reaming. Fixed-Diameter Hole Opener: Drill longer intervals in soft clays and shales to medium-hard shales and limestones, and sticky formations where balling problems are encountered. Staged Hole Opener: Achieve high-quality hole opening at an aggressive rate of penetration, even in more consolidated formations. Borrox AP Reamer: Get enhanced and fully customizable hole-gauge-maintenance and torque-reduction characteristics for a variety of formations and applications. We deliver accurate directional azimuth, inclination, and tool face data in all drilling environments from routine to extreme. Our measurement-while-drilling (MWD) systems leverage several telemetry methods to reliably transmit data to the surface, even in wells subject to heavy vibration, high-lost-circulation-material content, high flow rates, and high doglegs. In MWD, there are three main sets of data that we look for and transmit. Directional Information which mainly comprises of measure of inclination and azimuth at a location. Measurements of inclination, azimuth, and tool face are also measured at specific intervals to ensure well does not venture outside restricted drilling space. Formation Properties are measured to make it possible to perform geosteering, or directional drilling based on measured formation properties, rather than simply drilling into a preset target. Our shock tools are designed to provide an improved rate of penetration and to minimize axial vibrations produced by the drill bit during drilling operations. The tool will absorb shock load on the drill string and drill bit. The robust nature of our shock subs means that they can drill in any type of rock formation whether soft, medium or hard. The Shock tools also reduce vibrations utilizing a series of springs and they can be equipped with light, medium or heavy weight springs to accommodate various drilling conditions. Our shock tools are designed to absorb shock and vibration and vertical bit displacement in drilling applications. This gives the driller ability to calibrate weight on bit and rotary speed, resulting in faster penetration rate. Absorption of shock helps in maintaining and lengthening the lifespan of the drilling equipment as well as maintaining the integrity of the bottom hole assembly in general. Geowells International Ltd offers high quality, international standard whipstocks which are used to cut a window into existing wellbores. We provide whipstocks that can be used in a variety of wellbore configurations. They can be used in a vertical high angle hole for sidetracking the original well or in preparation for directional or horizontal drilling. Not only can our high-quality whipstocks be used to exit casing for horizontal entry into alternative productive well zones, but also to sidetrack wellbore damage, junk in the hole, or other negative well conditions. They can also be used to re-enter zones with economic reserves still in place. We offer a variety of high-tech motors with configurable power sections that offer a wide range of configurations to adapt to one’s drilling requirements. Power, torque, and speed can be calibrated to perform in an extensive range of drilling applications including vertical, directional and horizontal wells, high-temperature drilling, synthetic, oil and water based mud systems, performance drilling, extended reach drilling, shale plays and motor above rotary steerable system. Low and medium speed motors with high torque for the maximum rate of penetration and long-life downhole. Slow speed motors that match the RPM of roller cone bits. Our rigs help to fully optimize your drilling operation with increased horsepower, increased pumping capacity and enhanced safety standards.